Completed in 1829 during the first great Canal Era when arguments over Constitutional restraints kept Congress from using Federal taxpayer money to fund inland waterway construction, a private company completed the 17-mile waterway between the Chesapeake and Delaware Bays. The original waterway was a tollway ten feet deep and sixty-six feet wide, with a boat channel thirty-six feet wide. It had four locks, each 110 feet long and 22 feet wide, later enlarged to 220 feet long and 24 feet wide. The canal system later gave way to the faster and more economical railway by the time of the Civil War. Today, the Canal has 5 fixed bridges and one lift bridge. The four locks have been removed. The Chesapeake and Delaware Canal serves as an important inland link in the Atlantic Intracoastal Waterway from Boston to Miami. 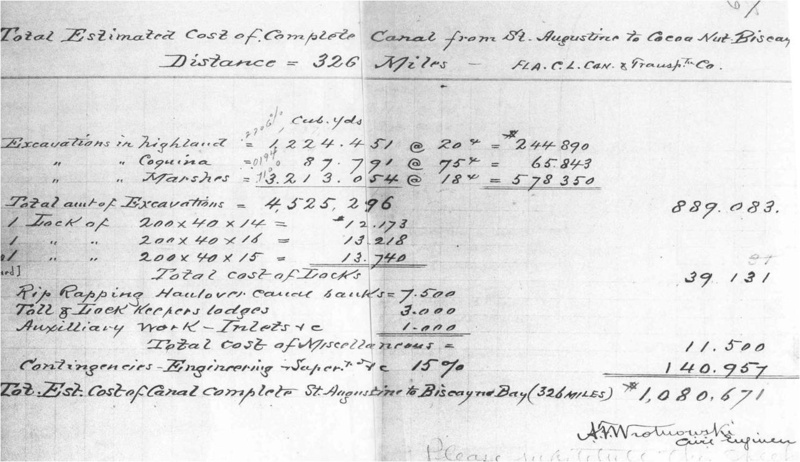 This entry was posted in Atlantic Intracoastal Waterway, Chesapeake and Delaware Canal, Tolls and tagged "Florida's Big Dig", Atlantic Intracoastal Waterway, bridges, Canal Era, Canals, Chesapeake and Delaware Canal, dredges, dredging, Federal funds, inland waterways, locks, private enterprise, railroads on September 20, 2014 by Florida's Big Dig. Bucket dredge in the Matanzas -Halifax rivers Cut south of St. Augustine ca. 1893. Large steel buckets attached to a continuous heavy chain scooped up sand, clay, and rocks, and then dumped the material on either side of the Cut via conveyor belts. Among the earliest of the dredges employed, the bucket dredge soon fell into disuse as chains often broke under the strain of conveying heavy spoil. Eighty to a hundred men with picks and shovels opened up ditches where little or no water existed. Courtesy. St. Augustine Historical Society.